This space wallpaper is an artist’s impression showing the yellow hypergiant star HR 5171. This is a very rare type of star with only a dozen known in our galaxy. Its size is over 1300 times that of our Sun — one of the largest ten stars found so far. This space wallpaper is an artist’s impression showing the yellow hypergiant star HR 5171. This is a very rare type of star with only a dozen known in our galaxy. 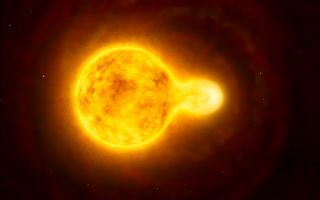 Its size is over 1300 times that of our Sun — one of the largest ten stars found so far. Observations with ESO’s Very Large Telescope Interferometer have shown that it is actually a double star, with the companion in contact with the main star.